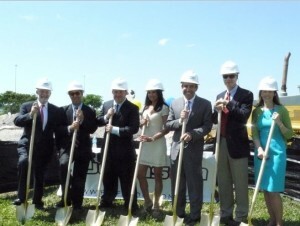 BOCA RATON, FL (June 3, 2013) – Promise Healthcare, Inc., a leading national long-term acute care (LTAC) hospital company headquartered in South Florida has commenced construction on its newest facility, Promise Hospital of Miami-Dade: William M. Vazquez Campus. Designed as a 56,000-square-foot, 60-bed single-story facility, the new hospital will treat critically ill patients with unresolved, acute, or catastrophic illnesses, as well as multi-organ disease processes requiring a longer hospital recovery period, aggressive therapy services and/or complex wound care. Modeled after the successful custom design and build of Promise Healthcare facilities in Louisiana and The Villages in Florida, Promise Hospital of Miami-Dade will provide LTAC services supported by the latest technologies in safety and medical equipment. Located at 14001 NW 82nd Avenue in Miami Lakes, Promise Hospital of Miami-Dade will be the first of its kind in the region. Along with Promise Healthcare officials, Mayor Michael Pizzi and Carol and Stu Wyllie from The Graham Companies were on hand to celebrate the start of construction on Promise Hospital of Miami-Dade. Peter Baronoff, Chairman and Chief Executive Officer of Promise Healthcare, Inc., said Promise is committed to serving the Miami Lakes community. “We are honored and privileged for the opportunity to expand our presence to the Miami Lakes community and are looking forward to working collaboratively with all the other hospitals and health care providers in the area to enhance and strengthen the continuum of patient care,” says Baronoff. Baronoff also expressed appreciation to the Graham Companies for playing a critical role in making the vision of Promise Hospital of Miami-Dade a reality. “The Graham Companies has been instrumental throughout this entire process. It has long-paved the way for community development in Miami Lakes, and we are thankful for its support in bringing the vision and distinctive health care benefits of Promise Hospital of Miami-Dade to the residents of Miami Lakes and its surrounding communities,” he stated. With an estimated completion date of early 2014, the hospital is expected to yield more than 150 full-time jobs upon opening. Headquartered in Boca Raton, Florida, Promise Healthcare, Inc. (www.promisehealthcare.com) is one of the largest long-term acute care (LTAC) hospital organizations in the country. With more than 2,000 staff members and 13 hospitals nationwide, Promise hospitals utilize an interdisciplinary approach to healing and wellness. Promise’s distinctive LTAC hospital environment provides acute medical care and aggressive therapy services for patients with unresolved, acute, or catastrophic illnesses, as well as multi-organ disease processes who require a length of stay of 25 days or more. Promise specializes in acute respiratory/pulmonary care (including ventilator management and weaning), complex wound management, and treatment for multi-organ failure and post-surgical complications. 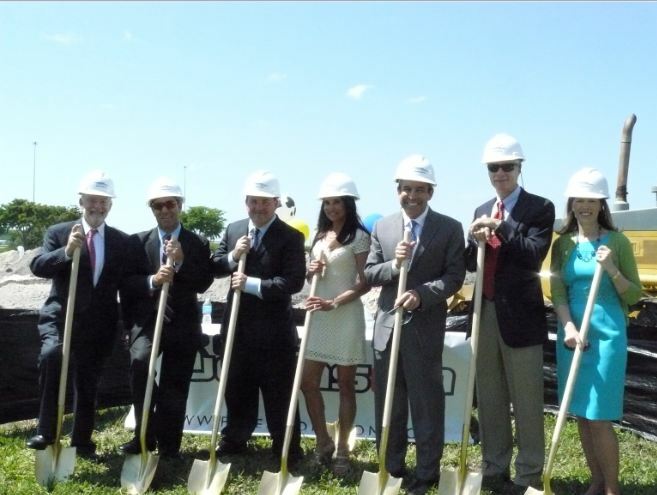 Promise Healthcare, Graham Companies and Miami Lakes officials join in a groundbreaking ceremony for the new Promise Hospital of Miami-Dade to be located in Miami Lakes Business Park West. Pictured (from left) Promise senior vice president Mike Cornblatt, Promise executive vice president of hospital operations Richard Gold, Mayor Michael Pizzi, Carmen Pasquale, Promise chairman and CEO Peter Baronoff, and Stu and Carol Wyllie of The Graham Companies.